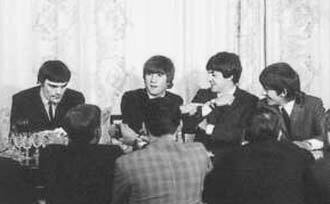 ABOUT THIS PRESS CONFERENCE: Ringo Starr collapsed on June 3rd 1964 with severe tonsillitis. With Ringo resting at University Hospital in London, Brian Epstein hired Jimmy Nicol as a fill-in drummer so that the 1964 Australasian Tour could continue as planned. After being temporarily cured, Ringo would rejoin the group in Melbourne on June 14th. His tonsils would later be removed in December. 3000 Adelaide Beatles fans waited in line for tickets, 30,000 turned out in force to witness the spectacle as the Beatles greeted the crowd from the Town Hall balcony, and over 200,000 Beatlemaniacs lined the Beatles' motorcade route according to police estimates. EMI National Promotions Manager Kevin Ritchie, who was with the Beatles in Adelaide, would later remember: "I found George wandering around the hotel feeling desperately homesick just after the press conference. He was feeling a bit left out and a bit overcome by the welcome. He said he desperately wanted to get home." 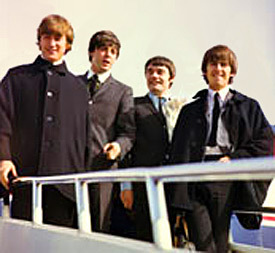 The Beatles and Jimmy Nicol performed four concerts over two nights in Adelaide before moving on to Melbourne. This press conference marked the Beatles' June 12th arrival in Adelaide with Jimmy Nicol, speaking from the South Australia Hotel. 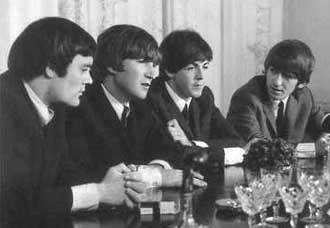 Q: "And now for their first press conference in 'South' Australia, the fabulous Beatles! Welcome!" Q: "Well fellas, what did you think of the Adelaide reception?" JOHN: "Oh, it was great! The best ever!" Q: "Was it like what I'd mentioned to you on the plane it would be?" JOHN: "Yeah! It was better!" Q: "Was it like anything you'd ever had before?" JOHN: "No. We've never done one of those 'drives' as well. It was marvelous." Q: "How would it compare with the ones in the United States when you arrived there?" PAUL: "This was bigger. There was more people there." Q: "Do you think it was very well conducted?" JOHN: "Yes. Everybody was well behaved." Q: "Did you get a fright at all outside the Town Hall?" JOHN: "Not fright. Shock, you know-- because there was so many." Q: "Do you ever get this feeling that maybe someone's gonna try and knock you off or something?" GEORGE: "I had a feeling we might've got shot, 'cuz it's the first time we'd been sitting in the back of a (convertable) car waving, you know." Q: "I noticed you took alot of shots (photos) from the back of the car, George." Q: "What was it that you dropped off of the balcony, Paul? GEORGE: "That was, uhh... ME!" PAUL: "It was him who dropped something off?" GEORGE: "No. I meant you dropped me." Q: "Were you disappointed that the airport was closed-- that the kids couldn't get close to the plane?" JOHN: "I didn't think it mattered-- with them all being able to see us anyway along the route." GEORGE: "...because they saw us better I think by lining the road. 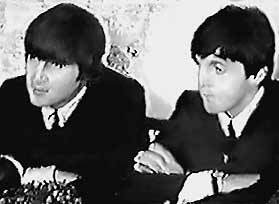 They saw us better than if we'd just..."
PAUL: "There he is! Jimmy!" Q: "There's Jimmy Nicol-- drummer for Ringo Starr." Q: "Tell me-- What did the Lord Mayor say to you?" GEORGE: "Uhh, he said it was very nice to have us in-- he was all pleased, and 'have a drink.'" Q: "And what did you say to the Lord Mayor?" Q: "What did you drink?" PAUL: "Scotch and Coke. Coke, actually." Q: "When you make up a new number, how long do you rehearse it for?" JOHN: "Sometimes it takes an hour or two." PAUL: "Normally, with new numbers, we don't rehearse them until we record them." Q: "Tell me, John-- With these capes that you wore today, did you pick one of these up in Amsterdam or something?" JOHN: "No, the first one we saw was in Amsterdam when we were going to these canals-- some lad had one on. And, uhh, we couldn't get any. You know, we could get one which wasn't the right color... Green. We had four made in Hong Kong-- copies of this one, in this material." Q: "I, being a little older than you four good-looking gentlemen..."
Q: "Just a little older, as a matter of fact... I will remember the launching of Frank Sinatra, and Johnny Ray, and Elvis Presley-- but THIS to my mind is unprecedented by virtue of the fantastic build-up and the publicity and all the press agents. And I'm not detracting in any way from the talent that you obviously have. How much do you attribute to Brian Epstein and his public relations men? And how many are there to your knowledge?" JOHN: "We've never had more than one P.R. fella with us, ever." PAUL: "It's a rumor about that." JOHN: "And Brian's only got one for each artist he's got-- so they have their own, you know, and they don't work together. And we've only ever had one. Most of the time we didn't have one till about six months ago." PAUL: "But alot of the success is due to him." Q: "Jimmy, do you think that Brian Epstein is going to wave his magic wand at you sometime and include you as a fifth Beatle? Or a stand-in drummer for Ringo permanently?" JIMMY: "That I don't know." Q: "What happened with Frances Faye? You went to play the drums didn't you, Jim?" JIMMY: "No. I went down to, you know, enjoy myself." Q: "How did you get up on-stage? Did she call you up?" JIMMY: "Well, as soon as I walked through the door she was just finishing the latter part of her act. And she said 'The Beatles are coming!' because everyone turned 'round. And she invited me back to the dressing room..."
JOHN: (comically) "Oh!! You didn't tell us about THAT!!" JIMMY: "...where we had a drink, you know. And then the second show I did the whole lot." Q: "She gave you something in return, didn't she, Jim?" JIMMY: "She hasn't given me anything but she going to. She going to give me all her albums, and also she's having a sweater made for me." Q: "Jimmy, having played with all these bands-- what's it like being suddenly thrust in with The Beatles?" JIMMY: (laughs) "It's the 'end,' you know!" Q: "Do you have any trouble getting the same beat as Ringo?" JIMMY: "Well, I do my best." Q: "Have you ever been involved in any zany publicity stunts?" JOHN: "No, we've never had to, actually. Anything that's a bit zany usually happens..."
PAUL: "When we first started off, we were trying to think of 'em. We didn't have a manager or anything, so we were just sort of sitting around thinking of ones we-- Uhh, one. We were gonna try and get one of us to jump in the Mersey and swim it." JOHN AND PAUL: "But none of us could swim that far!" JOHN: "I don't remember this stuff-- he keeps saying it." PAUL: "It's true, John, it's true!" JOHN: (giggling) "I think you'd been on your own, there." PAUL: (joking) "I remember I was five-- I thought, 'I'll jump in and I'll swim the Mersey.' No one with me at the time. I'm a liar-- I'm sorry!!" Q: "What have been your most exciting moments in show business, individually-- George?" GEORGE: "Uhh, I can't remember, there's so many! Ever since last September, you know, everything's been exciting. I think when we got to America and we found that they'd gone potty." GEORGE: "And when we got back to Britain last October, we'd been touring Sweden-- and when this Beatlemania thing started, you know, we didn't hear about it because we were away. And we just landed in London-- everybody was there smashing the place up!" Q: "Fellas, you've had this potential talent some years ago, but in your wildest dreams did you ever anticipate that you would reach the state that you have reached now?" JOHN: "You know, nobody imagines anything like this." Q: "What about your act tonight at the Centennial Hall?" Q: "Your concert. How long will it last tonight?" PAUL: "Thirty minutes, each house." Q: "Are you constantly changing your act, or was it..."
JOHN: "We change it according to each, sort of-- sometimes city or state or-- depending on what record's the most popular we usually change the order. They've only got the same amount of records released in each place anyway." Q: "What about when you played the Royal Variety Performance last year for Her Majesty? Same act as always?" JOHN: "I think we had some jokes in that one because the people weren't screaming so they could hear what we were saying, you know. That's the only difference." PAUL: "And it was shorter, as well." Q: "You were telling me, I think it was George on the plane coming down from Sydney, I asked 'Had you ever thought of playing in pantomime as a group, the Beatles?' But you did do a special show..."
GEORGE: "Oh yeah. We didn't like the idea of doing a pantomime, so we did our own show-- which was more or less like a Pop show but we kept appearing every few minutes, dressed-up-- you know, for a laugh." JOHN: "Nobody laughed, mind you. We were." Q: "Do you do comedy sketches on-stage at all in any touring shows in England?" GEORGE: "No. Only for our Christmas shows. And we've done a couple of sketches in TV shows." Q: "Are you ever troubled with the hoards of screaming fans outside the hotel room where you stay, for sleeping purposes? Can you sleep through all this sort of thing?" JOHN: "They never stay there all night screaming. You know, I've never known it." Q: "Well, last night they were up till about midnight." JOHN: (giggling) "Well, you know, I don't even dream of going to bed before one!" Q: "Are you ever scared of being hurt by some of the over-enthusiasm? Have you ever been hurt?" PAUL: "That's why we're not scared, because we've never been hurt. Maybe if we had, we'd be a bit worried about it." Q: "In South Australia, not only teenagers go wild over you, but maybe you noticed today coming in from the airport that a heck of alot of adults... especially grandmas..."
Q: "Is it the same in England?" JOHN: "Well, I've never seen so many grandmas at once." Q: "You seem to be all very attentive. You can see what's going on. I noticed, behind you in the car, that you could sort of follow everything that was going on-- people with different posters. You're really looking at the people, aren't you." Q: "You're very aware of everything around you." JOHN: (giggling) "I think you've got to be, you know. You might get shot." Q: "Alot of the kids in Liverpool, apparently, are a little disappointed that you haven't been back to the Cavern for so long to sing. Why is this?" JOHN: "If we played at the Cavern every so often we'd never get to Australia and America or anywhere else. We've gotta make a choice, you know. And most of those people that are complaining weren't there when we were originally there anyway." Q: "How did Brian... Did he discover you all individually and put you together as a group?" JOHN: "No. We'd already made 'My Bonnie,' and all those other rubbishy records for Polydor. And kids from the Cavern, 'round about Liverpool, were going into his record shop and saying 'Have you got My Bonnie by The Beatles?' So he got interested and he asked one of the kids who were we. He thought we were German. And he came 'round -- We were playing at the Cavern, which is about a hundred yards away."